Celebrations on the wet at WSK Final Cup. Today it has been a festival of driving skills for the 230 drivers partaking in the WSK Final Cup at the Adria Karting Raceway. 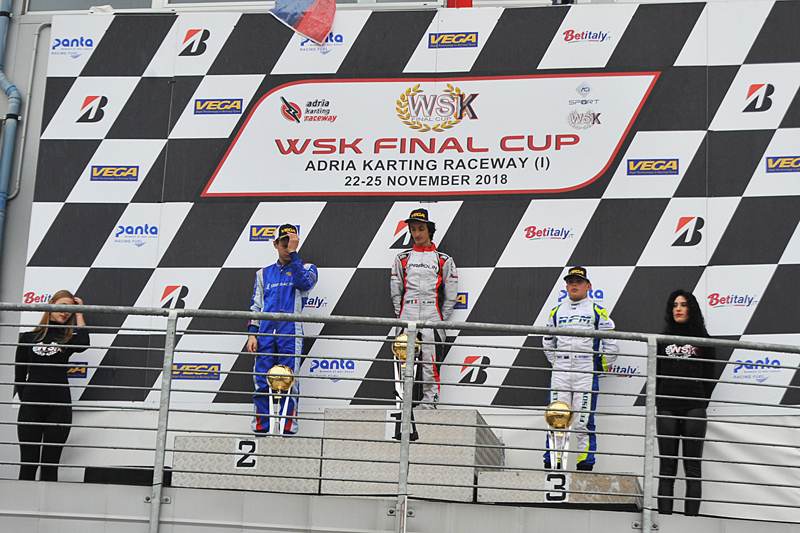 The circuit located in Adria (RO) staged, in fact, the closing of the three races making up the series organized by WSK Promotion and rain has characterized the whole weekend in this occasion. The surface of the circuit has constantly been wet, which required drivers to use all their skills in a crucial moment for the final classifications in all the four categories. 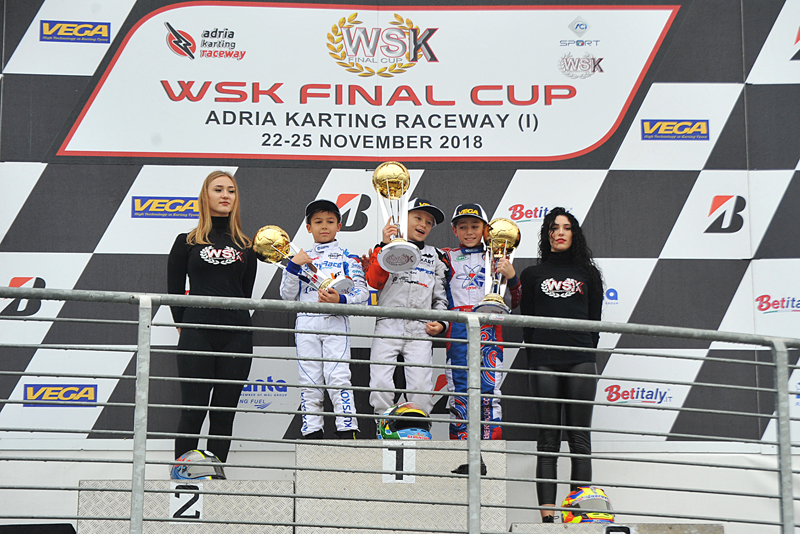 WSK Promotion ended its 2018 campaign at the Adria Karting Raceway: the appointment is now for next season, that will kick off with WSK Champions Cup, on January 27th 2019. Rosso wins the Final, Travisanutto king of OK.
A lot of twists characterized the OK Final: the Dane Nicklas Nielsen (Praga-Parilla-Bridgestone), who won Prefinal B after the Italian Lorenzo Travisanutto (KR-Parilla) had the upper hand in Prefinal A, had to stop early in the Final. This gave way to the Swiss Leandro Anderruti (KR-Parilla), who installed himself on top early on, overtaking also poleman Travisanutto. The latter managed to bounce back and regain the lead but had to stop in the closing stages due to the failure of the drive chain. The Italian Andrea Rosso (Parolin-TM) managed to find his way past Anderruti and claim a deserved win at the end of a difficult race. The Dutch Kas Haverkort (CRG-TM) followed him and relegated Anderruti to P3. Travisanutto managed to stay on top of the classification though, thanks to the victory in Prefinal. On top, the podium of the Final OK category. The 60 Mini Final to Bergstrom, classification lead to Powell. The heat of the competition betrayed several 60 Mini drivers that compromised their races with some penalties. The Swede Joel Bergstrom (Parolin-TM-Vega) managed to win the Final, while the Russians Alexandr Tibekin (DR-TM) and Alexander Gubenko (Parolin TM) lost the podium due to their dropped front fairings. The Russian Krill Kutskov (Parolin-TM) and the Jamaican Alex Powell (Energy-TM) inherited, therefore, P2 and P3. Powell celebrated the podium claiming also the victory of the overall 60 Mini classification. Above, the podium of the 60 Mini Final. The OK Junior final to Minì, overall victory to Barnard. The Italian Gabriele Minì (Parolin-Parilla-Vega) and the British Taylor Barnard (KR-Parilla) won the two Prefinals but were overtaken at the start of the Final by the Australian James Wharton (FA-Vortex). Minì displayed a great shape and regained the lead shortly after, pulling away. Wharton was also overtaken by the Russian Kirill Smal (Tony Kart-Vortex), while Barnard slipped down to P4, but he held on to this result which earned him the final victory of the OK Junior classification. Above, the podium of the OKJ Final. Double win in KZ2 for Renaudin. 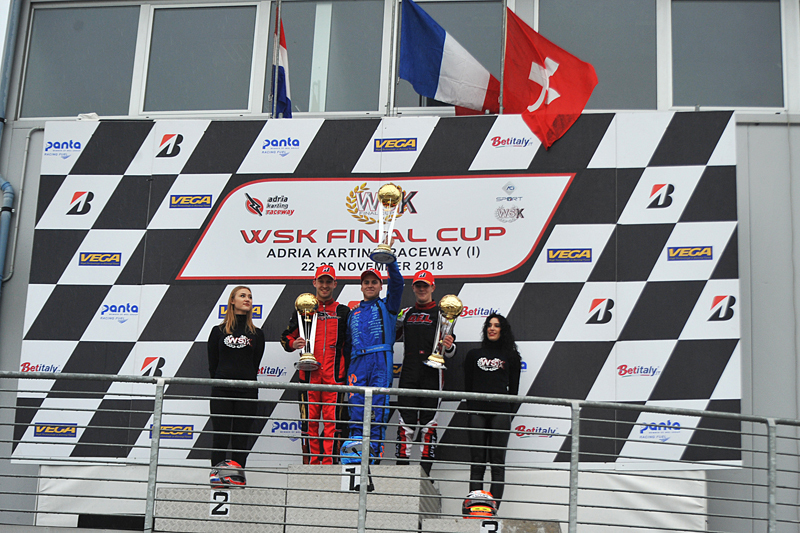 The French driver Adrien Renaudin (SodiKart-TM-Bridgestone) ended also the weekend of Adria unbeaten. He won, in fact, the KZ2 Final and secured P1 in the classification. Started from the pole position, Renaudin has never been challenged by the Swiss Jean Luyet (CRG-TM), who followed him for a long time. The Swede Axel Bengtsson (Kosmic-Vortex) put in an extraordinary comeback from P12 and climbed up to P2, before being penalized for the displaced front fairing. A closing battle allowed the Dutch driver Dylan Davies (DR_Modena) to end second behind Renaudin, while Luyet was third. Above, the podium of the KZ2 Final.